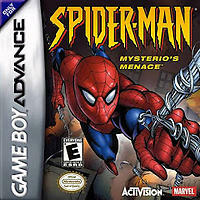 The first Spider-Man game on the Game Boy Advance has the superhero fighting his way through thug-filled streets, a factory, casino, and nightclub throughout New York City. Common adversaries include ninjas, skeletons, and mobsters, but the web-slinger will also face powerful boss enemies like Scorpion and Electro. Players select their path through the game by choosing One of the three initial crimes to investigate. When a level is completed, an additional mission on that path is revealed. Some levels require specific tasks to be accomplished, such as collecting stolen artifacts or rescuing hostages, while others merely need to be traveled through. Although he is endowed with superhuman strength and a mysterious spider-sense, Spider-Man must still keep track of his health and web fluid levels, both of which can be rejuvenated through power-ups. Other power-ups include invincibility, various types of armor, and items that increase the effectiveness and storage capacity of his web shooters. Finished levels can be revisited in order to uncover missed power-ups, and a password system is used to save games in progress.